Writing a book in alternating point of view is becoming more and more common. While books in the third person have often switched between several narrators (lookin’ at you, Harry Potter), “alternating POV” or “dual POV” refers to two (or occasionally more) first person narrators who trade off chapters or scenes to tell a story. For authors writing a YA love story, this can be a popular choice, because it allows the reader to get into the mind of two characters at once on an intimate, personal, sensory level. But just because writing in alternating POV has advantages doesn’t mean it’s easy to do. Like all stylistic choices, an author has to make it for a reason, and then follow through with the best execution possible. In short, there are good dual point of view books, and then there are…less good ones. Here’s how to know the different. Right: There’s a reason to use two viewpoints. Simple fact: writing craft matters. Stylistic decisions can’t be arbitrary. If one character is a relatively flat character, who won’t grow much over the course of the story and doesn’t have a lot of bearing on the action, is it really necessary for them to get a lion’s share of the narration? The best dual POV stories use the two narrators to tell two sides of a story (especially a crime or mystery—think Gone Girl), get inside the head of each character in a couple as they fall in love (like in Perfect Chemistry, Pushing the Limits, or He Said, She Said) or two characters who start in different geographical places and eventually come together (like Will Grayson, Will Grayson). Wrong: Both viewpoints convey the same character growth, plot information, or thematic material. Again, if the dual POV is just hitting the same notes again and again, it’s just dragging the pacing and taking twice as long to tell one story. Unless you’re going full-on Rashomon with your storytelling (which is a valid option!) you need to make sure your alternating POV doesn’t merely retell the same scene twice in a different voice. Right: The voices sound—and look—distinct from one another. Developing character voice is crucial in any book. Developing character voice in dual POV books is, well, twice as crucial. Good dual POV books have two narrators that sound entirely like themselves—and not like each other. They should use opposite (or contrasting) registers of speech, formality, slang, and so on. But consider, too, the amount of psychic distance in each: does one narrator wear her heart on her sleeve, while the other one keeps a tight lock on his emotions? Is one character up close and personal with sensory details, while the other is very much locked in intellectualizing and philosophy? Finally, consider the white space on the page. A very powerful way to distinguish between narrators is to utilize the psychological phenomena of white space on the page—a page with lots of line breaks and short paragraphs will subconsciously register as a very different voice than one with dense, wordy paragraphs. Wrong: The voices are indistinguishable. Once again, dual POV has to count! And if the experience of reading the two characters is the same for each, then there’s no reward for the reader. Give your book to an editor without the chapters named with narrators: can she tell which is which? If so, you’re doing great. If not…time to revise. Right: The right character narrates the right scene. Balancing which scenes get told by which characters is one of the trickiest parts of writing dual POV novels. Usually, one character shouldn’t dominate in terms of word count; you want an even split between the two. But well-executed dual POV not only balances the amount of “camera time” each narrator gets, but also makes sure that each scene is giving to the character whose POV will be most affecting in rendering the action. When it doubt, hand the narrative reins to the character who has the most to lose in that scene. That’s a surefire way to make sure that the emotional stakes for the narrator—and therefore the reader—will stay high. If several scenes (or chapters) in a row are in the same character’s POV, it can be tempting to revise by inserting scenes in the other character’s POV in between to “break up” the stretches of the first character’s narration. But switching POVs just for its own sake doesn’t work; it just slows things down and waste the reader’s time. If you find yourself with lots of limp scenes in one character’s POV, you either have to find a way to insert some structure and dynamism to those scenes, or revisit whether dual POV is right for this story. Right: Each character has their own world. Setting might seem like the one thing that doesn’t change from character to character, but in fact it’s one of the most important things that does change. First person allows the reader to experience the setting through the eyes and experiences of a particular character…which means that each character who narrates will see the setting differently. A less-well-off character will notice the shabbiness of his bedroom and feel ashamed, while his wealthy co-narrator may only notice that he’s got a lot of basketball posters in there. 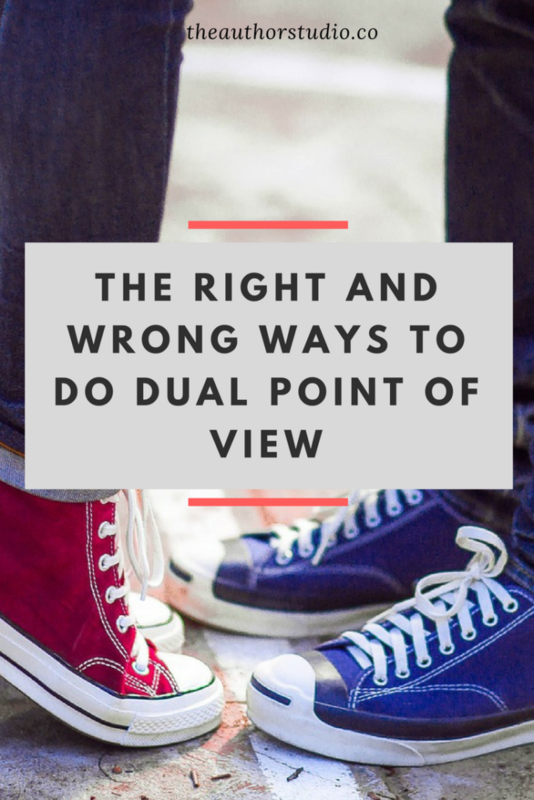 Dual POV is always subjective, and setting is no exception. Wrong: The writer gets no outside input. Writing two first-person narrators in a single novel is essentially writing two entire stories—all the character growth, plot, pacing, and prose has to be there times two. While drafting may come easily, it can be easy to lose steam and hard to stay motivated while revising, since you’re so close to the material that it can be hard to tell whether or not you’ve broken any of these rules. You’ll really need someone who isn’t you—who doesn’t know these characters as intimately as you do—to gauge whether or not you’re pulling it off. An outside editor can really help bring a professional and impartial eye to your work, and make your dual POV shine. So glad it was helpful! LOVE the idea of vocab lists for each character—that’s a super smart strategy. Thanks, Lauryn! Great post by you, too. Editing out of order is a very smart idea.